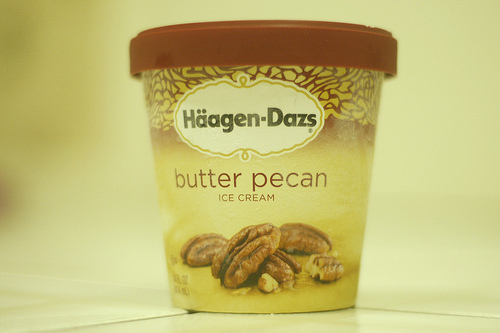 I typically don’t eat Haagen-Dazs ice cream, but since it was buy one get one free I decided to try their Butter Pecan flavor, which was one of the lower sugar choices in their lineup. It’s not that there is anything wrong with this brand per se, but Haagen Dazs feel very generic to me in that it has been around as far as I can remember and isn’t marketed as being particularly healthy or different. I guess being around since 1961 you could call it a ‘classic’ ice cream company. Having said that, I’ll try to put aside my biases aside when reviewing this product. This ice cream tastes like your typical butter pecan, except that it it has a very strong cream flavor. I’ve made ice cream myself and used a large proportion of heavy cream (which contains 36%-40% milk fat) and it tasted similar. My problem with this product is monotony – in both appearance and flavor. The brown pecans set against the plain white aren’t particularly visually appealing, but more importantly the flavor of the thick, creamy base isn’t different enough from the sweet pecans (which aren’t exactly crunchy), and as a result I get tired of eating this ice cream quickly. To put it another way, this ice cream lacks balance between two opposing flavors and textures. If I was tasked to improve the flavor, first I’d make the base lighter, possibly adding some other mild flavor and natural food coloring. Then I’d add more pecans, using larger ones if they exist, and possibly removing or reducing the butter from the pecans. Yes, I realize this would make the flavor less “butter pecan”, but the butter flavor and the cream flavors are too close for my taste. There is a nice portion of protein with 5 grams per serving, but the fat per serving (22 grams) is off the chart – its literally the highest I have seen in recent memory and helps to explain why the flavor is so heavy. I checked a few other brands and their versions of butter pecan all had less fat, with Bryer’s butter pecan containing less than half fat per serving (roughly 10 grams). Personally, I value overall number of calories more than fat content, but as I mentioned those are quite high as well. In spite of my problems with high calories, fat, and taste, the ingredients in this ice cream are actually quite healthy, as least as far as ice creams go. There are no preservatives, no artificial colorings, no artificial flavorings, or even natural flavorings. In fact, there aren’t any thickening agents such as guar gum either. Though I don’t consider this latter category to be necessarily unhealthy, I almost always prefer less ingredients, especially ones that are not everyday items I would use in the kitchen. Some may spot “corn syrup” and associate that with “high fructose corn syrup”. While its true they are both made from corn, plain “corn syrup” contains more glucose as opposed to fructose, which is sweeter. While there is some research showing high amounts of fructose are harmful to the body if consumed frequently, some people maintain that these sugars all have similar effects on the body. After all, fruits naturally contain fructose (as well as gluctose and fructose), and table sugar is roughly half glucose and fructose. This sells all over but typically can be bought at Publix for around $4.69. A high-fat, high-calorie ice cream with reasonable ingredients that is worth a try for fans of butter pecan, but I found its heavy cream flavor a little too much. Posted on October 18, 2013, in Food and tagged bryer's, Butter, butter pecan, calories, cream, fat, Food, haagen dazs, heavy cream, Ice cream, pecan, sugar, Sweets. Bookmark the permalink. Leave a comment.